echoes in dust - fontaine b. special — fontaine b. For the exhibition “echoes in dust” Henrik Strömberg presented at Åplus exhibition space an installation of photographic works, collages and sculptures. 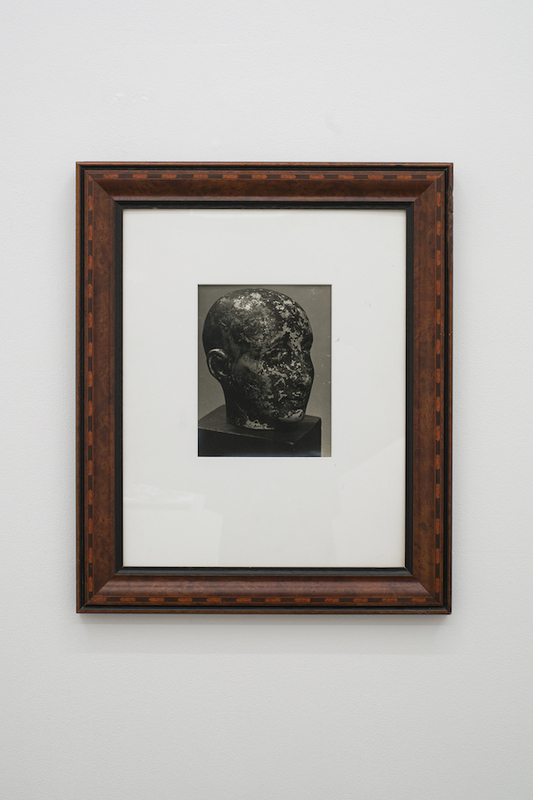 During the course of the show some of the works were reconfigured, thus altering the overall installation; Keeping the exhibition in a state of flux, selected special works by Man Ray and Jannis Kounellis was interlaced in the installation landscape. The interplay between works of different artistic periods as well as times on a larger scale. (b. 1890 USA – d. 1976 France) was a painter, a photographer and an avant-garde director. Proponent and representative of Dada movement, he also worked closely to Surrealism. Man Ray started producing his first ‚rayographs‘ in 1922, special photograms developed with a particular technique: placing actual physical objects onto photosensitized paper, he would later expose to light, thus resulting in a tonal reversal of the objects’ shapes on paper. Acclaimed with enthusiasm by dadaists, he developed the technique of ‚ready-made’s’: objects belonging to the every day life, decontextualized and deprived of their original use, which become works of art. Influenced by Marcel Duchamp, ambassador of Dadaism, as well as father of the ‚ready-made” concept, Man Ray aimed to promote and develop a substantial change of perspective from the artwork itself to the so called ‚Idea-artwork’. The artist denied the concept of pure and simple visual representation, thus re-evaluating and giving a new signification to the objects. Before leaving Paris for New York in 1921, Man Ray made several constructions that questioned the authority of logic and science over the imagination. This quirky instrument, which he called „Compass,“ was one. The fields of force to which it might respond are as erratic and potentially as destructive as a game of Russian roulette. It is „purely cerebral yet material“ (as Man Ray said of Marcel Duchamp‘s „Large Glass“), whimsical yet deadly earnest. (b. 1936 Greece - d. 2017 Italy) was the pioneer and one of the most important representatives of the artistic movement Arte Povera. As a student in Rome, Kounellis’s appreciation of his cultural roots did not isolate him from more contemporary influences. He was profoundly affected by the most avant-garde Italian art, ranging from Alberto Burri’s stitched scraps of sacks to Piero Manzoni’s “achromes”. Along with artists like Joseph Beuys, Mario Merz, Robert Morris and Richard Serra, he is part of a second wave of modernists who, in the 60s, radically expanded our vision of fine art with a new iconography of materials. Kounellis‘ work is comprised of painting, collage, sculpture, installation work, performance and theatrical shows. Starting as a painter, he produced series of audacious paintings entitled Alphabets, in which he stenciled letters, numerals, and even traffic markings – the most impersonal, universal signs – onto otherwise abstract canvases. In 1960s Kounellis introduced the use of everyday material to his work - such as wool, coal, iron, stones, earth, wood and objets trouvés, as well as animals to create sculptures and installations. The use of antithetical media, such as raw material and objets trouvés, expresses the tension and alienation of our contemporary society. The artist used the objects placing them in often startling juxtapositions, re-evaluating them by creating a new poetic context in which they represented the pivotal body of a new aesthetic outcome.